Ooh, another excellent review, this time from Black Music specialist, Kevin Le Gendre writing here for Jazzwise Magazine. Those of you who attended the Catch A Fire talk at the British Music Experience at the very start of the Lively Up! Festival will remember Kevin chaired an eminent panel of Tony Platt, Gary Crosby and Brinsley Forde talking about the making of Catch A Fire and its global impact. Like everyone else who went to the London Catch A Fire live show, he had a fantastic time! In 1973, when Bob Marley & The Wailers cut Catch A Fire, a landmark album not just in reggae but modern popular music, Jamaica as a sovereign state was just over a decade old. No greater celebration of the country’s 50th anniversary of independence could be conceived than in the form of Jazz Jamaica All Stars’ take on that chef d’oeuvre, because, to a large extent, the ‘small island’ has grown up with that original rebel music, so proud and defiant in tone, as an unofficial soundtrack. The re-imagining is about scale. 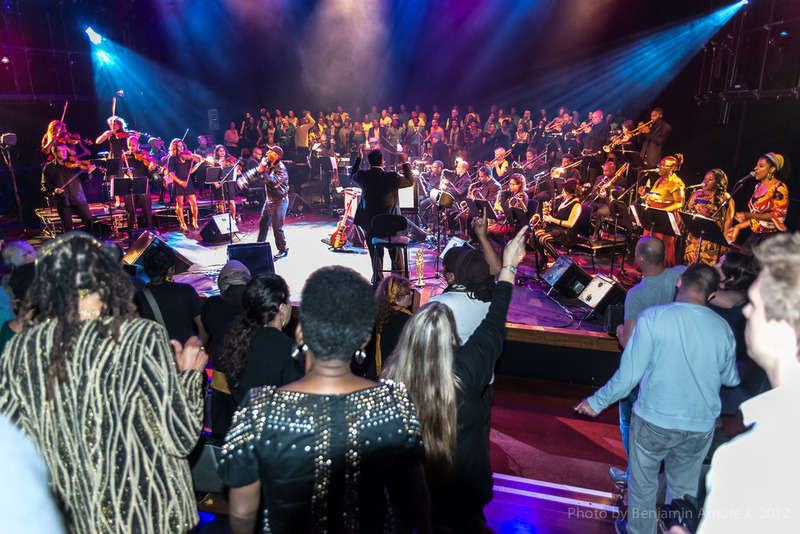 Alongside the 18-piece British big band appearing at the QEH earlier this week, are the eight strings of the Urban Soul Orchestra, the three backing singers of ‘Dem Threes’, and the lead vocal of Brinsley Forde, once of UK reggae pioneers Aswad. In the second half of the gig, when the backdrop disappears to spotlight 72 choristers from Voicelab, the Wailers’ five-man unit will have been ‘bigged’ up beyond expectation. As is apparent from the new scores of ‘Concrete Jungle’ and ‘400 Years’ this expanded palette serves a dual purpose: to show the absolute richness of the melodies penned by Marley and Peter Tosh and to push their harmonic implications into logical and unforeseen places. 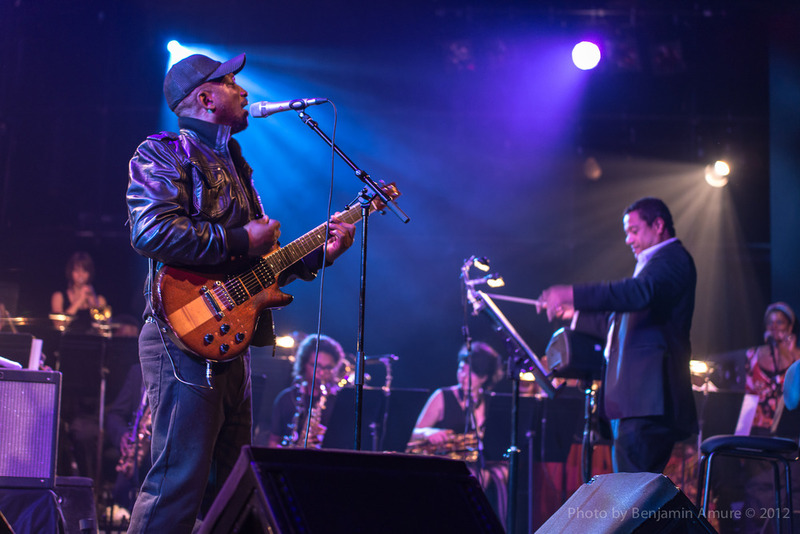 While double bassist-bandleader Gary Crosby (pictured above with Jason Yarde), and drummer Rod Youngs nail the offbeat down pat, Jason Yarde’s arrangements are imperious. His blend of full-bodied, singing motifs and stark, flinty interludes, particularly for the strings, captures and bolsters the melancholia and menace of the source material, as Forde makes an impressive fist of giving the original words requisite emotional depth and tonal precision. However, the sharpest twist in the tale of what proves a joyous, out-of-the seat performance is the subtext of classic R&B freighted in the leisurely but heavy punch of the music. It becomes explicit in the puckish quotes of ‘One Mint Julep’ that fit the easy skanking like a glove. A Ray Charles fan like Marley would’ve been irie. Here you go! 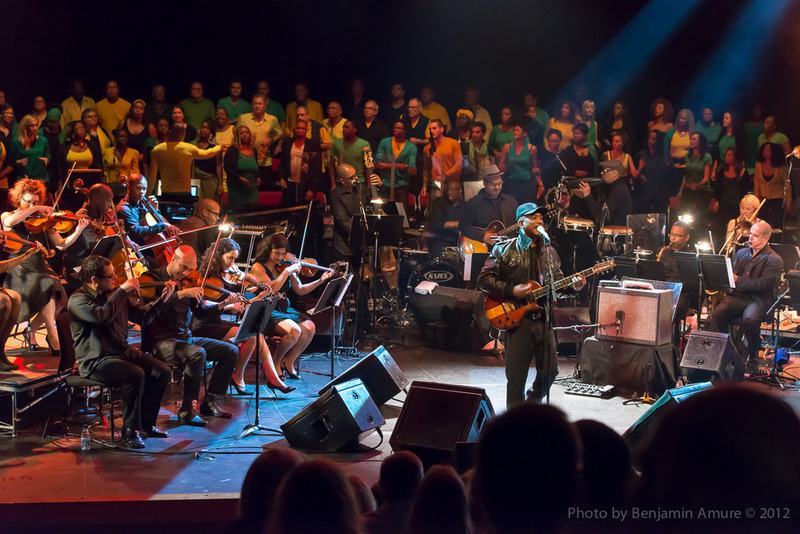 Another review of the London Catch A Fire show, this time from London Jazz News.